Pain, tenderness and inflammation around long head of biceps tendon often caused due to overuse injury among older patients especially older athletes ( 30+ age athletes and old aged patients 60+ age). 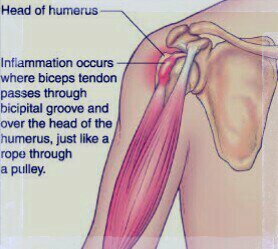 Pain often resembles Shoulder impingement syndrome, Rotator cuff tendinopathy. Occurs more commonly while performing or after sporting activities like lifting, throwing, overhead movement. 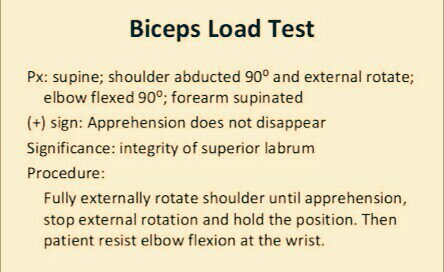 In UK prevalence rate of biceps tendon rupture is 0.53/100,000 over 5 years, with male:female ratio 3:1. Repetitive irritation friction leads to swelling of tendon initially. Continued irritation, traction, friction makes tendon thicker. Eventually long term irritation leads to adhesion formation around surrounding structures. Patients with biceps tendinopathy often complain of a deep, throbbing pain in the anterior shoulder that is intensified when lifting. Pain may be aggravated by overhead reaching, pulling and lifting activities. The pain usually worsens at night when sleeping on the affected shoulder. 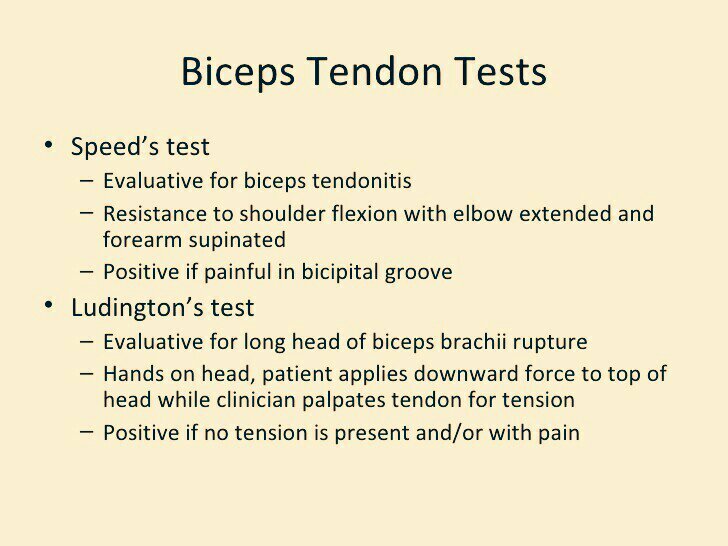 Pain with palpation over the bicipital groove is another physical exam finding in patients with biceps tendinopathy. Active elbow flexion may also provoke pain. 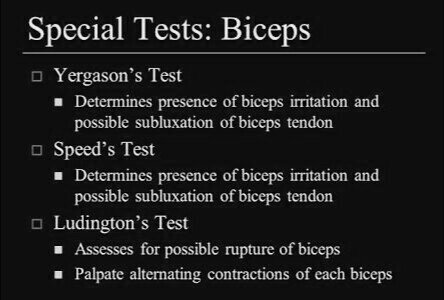 Cases associated with biceps instability, the patient may complain of an anterior shoulder “clicking” or “popping” sensation associated with throwing motions. Physical therapy has been commonly used for the treatment of tendinopathies, especially eccentric training. Intervention should include restoration of pain free range of motion, trunk and core stability and ensuring stable scapulothoracic rhythm. Pain free range can be achieved with such activities as Passive Range of Motion, Active Assisted Range of Motion, and mobilization. Painful activities such as abduction and overhead activities should be avoided in the early stages of recovery as it can exacerbate symptoms. Stretching and strengthening regimes are a common aspects of most therapy protocols. Therapists also use other modalities like ultrasound, iontophoresis, deep transverse friction massage, low-level laser therapy, Hot fermentation. OUR BODIES ARE WONDERFULLY MADE!